Oscars host Jimmy Kimmel did his best last night to focus on the positive. Right from his opening monologue, Kimmel emphasized that “this is a night for positivity,” saying the awards event was most of all an evening to celebrate the great films from 2017. Sure, he made a few Harvey Weinstein comments, most notably saying the Oscars statue was the perfect man because he keeps his hands to himself and is devoid of some notable male traits. But Kimmel then continued to focus on game-changing films like "Black Panther," "Lady Bird" and "Get Out." "I remember a time when studios didn't believe that a woman or a minority" could front a superhero film, he said. Of course, the late-night host added, "And I remember that time because it was March of last year." He also brought up gender inequality, including the pay gap between actors and actresses in Hollywood. Twitter was keeping tally on Kimmel's night, with those in the industry like Melissa Silverstein, the founder and editor of the website Women and Hollywood, tweeting, "So stoked that @jimmykimmel talked about the pay disparity between Mark Wahlberg and Michelle Williams ... #oscars #timesup." Kimmel gently encouraged winners to dedicate their speech to promoting change for gender equality or other worthy causes like supporting the survivors of last month's Parkland, Florida, shooting. And he just mentioned Parkland and the March 24 march. Others just enjoyed the jokes. MAGIC....Magic...magic at The Oscars ???? n Jimmy Kimmel ???? Now,thats hosting !!???????? Wow @jimmykimmel crushing the game. In a risky move toward the end of his opening, Kimmel announced that the show would be giving out a Jet Ski, among other prizes, to the Oscar winner who gave the shortest speech. Vulture called the gag "stupid," but "in a good way." "In a Letterman way. A stupid thing when everyone has serious faces on is always going to be at least a little funny," Vulture's Jesse David Fox wrote. 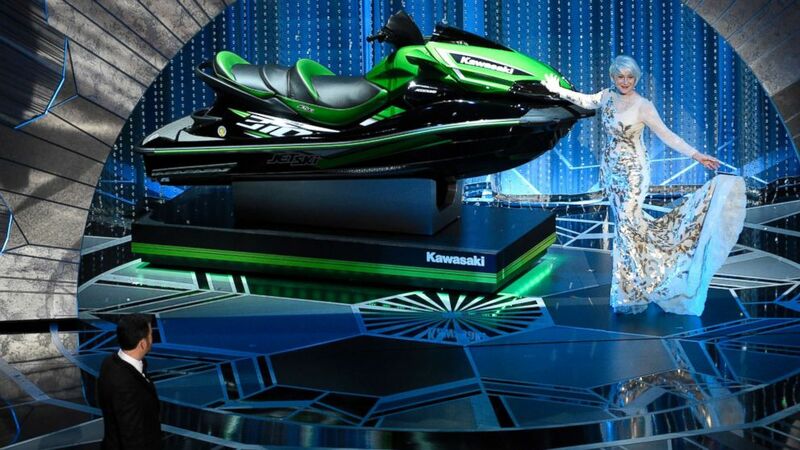 (Chris Pizzello/Invision/AP) Helen Mirren displays a jet ski as host Jimmy Kimmel looks on at the Oscars, March 4, 2018, at the Dolby Theatre in Los Angeles. Now, the show still ran over, so the gag didn't work logistically, but as Fox pointed out, Kimmel also called on "Get Out"'s Lakeith Stanfield to play the yin to the gag's yang by proclaiming if people ran over on time, he would come and scream ... you guessed it, "Get Out!" Overall, Fox and others were lukewarm on the whole bit, but one major outlier was The Verge, which called the move "pure genius." "For decades now, the Oscar ceremony has been a lengthy affair, usually running three or four hours, and sometimes going overtime. It’s usually made even longer by traditional, tedious “this show is so long” jokes from the hosts. This year, host Jimmy Kimmel went in a different direction," wrote Tasha Robinson. Kimmel also took the Oscars outside the venue and walked a bunch of A-list celebs to a nearby theater to surprise moviegoers with snacks and jokes. It was a fun, kinetic segment that most enjoyed, while some online made jokes about not wanting to be interrupted while screening "A Wrinkle in Time." (Jimmy Kimmel Live/Instagram) An audience at a movie theater nearby gets a surprise visit from Oscar host Jimmy Kimmel and other actors and actresses, March 4, 2018, in Los Angeles. Fans involved were ecstatic, one writing, "@jimmykimmel busts in and @Lin_Manuel is handing me sour patch kids and I'm hanging on to @trinmiller like I'm gonna die thanks @supriyalimaye for the tickets UNEXPECTED PERFECT FIRST OSCARS." You could tell it was a moment they wouldn't soon forget. Others, including media, thought the gesture was pure fun and reminiscent of Ellen DeGeneres' record-breaking selfie. That was really cool! 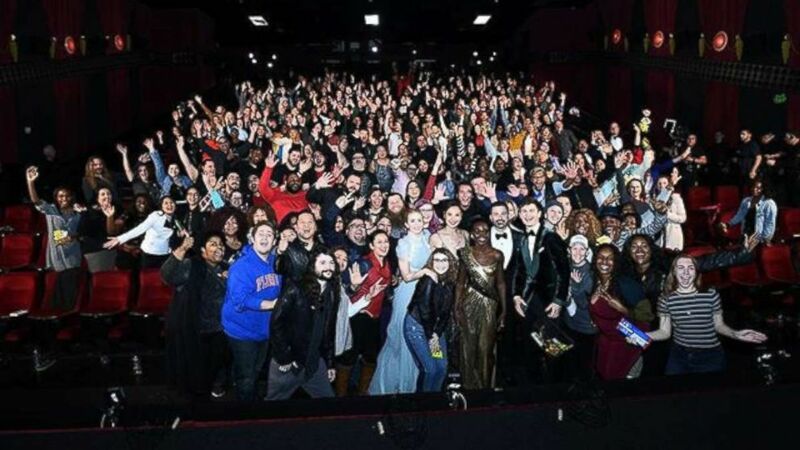 @jimmykimmel @GalGadot @HamillHimself @Lin_Manuel @armiehammer @MargotRobbie #EmilyBlunt @RealGDT and others thank Movie Fans LIVE during the #oscars at the theatre down the hall watching @WrinkleInTime screening! And last but certainly not least, Kimmel brought back Faye Dunaway and Warren Beatty to present best picture for the second year in a row after last year's mixup. "The Shape of Water" won after Dunaway made a simple comment about presenting the second time being "lovelier" and all was right in the world yet again. Instead of focusing on the gaffe from the year before, fellow directors and fans congratulated Guillermo del Toro on his big win. It was a fitting end to a show Kimmel said would focus mainly on movies. What an incredible achievement last night for Get Out and Shape of Water. Hope more of these films get the recognition they deserve, and not a one-off. Congrats to Jordan and GDT! The Shape of Water is an excellent film. Get Out is an excellent film. Phantom Thread is an excellent film. Lady Bird is an excellent film. Dunkirk is an excellent film. Three Billboards is an excellent film. Only one could win, but they’re all excellent.